We are proud to have partnered with FiveGoodFriends in writing the “Technology and the Home” section of the new APIA Guide to Living Well. 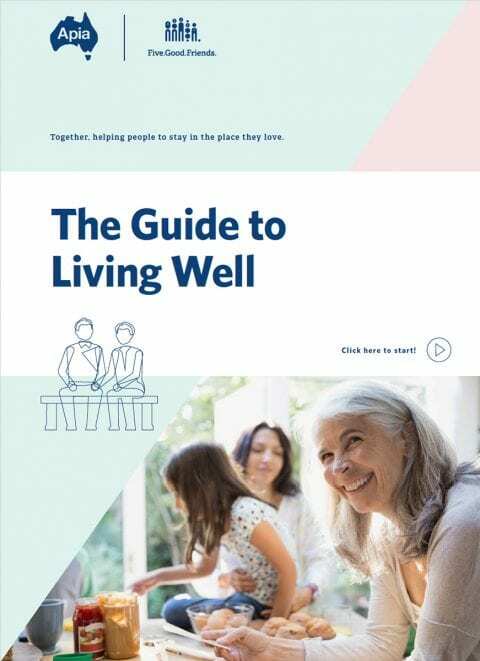 The Guide is an excellent resource for older Australians and their families who are looking for information on how to live independently and well as they age. Created by Apia and Five Good Friends, it includes information from some of Australia’s leading aged care experts about specific issues, from maintaining independence to finance, to how technology can help keep you connected with loved ones and the community. In the “Technology and the Home” section, written by eevi in conjunction with APIA, FiveGoodFriends and Frontier Networks, we discuss the benefits of adopting technologies later in life. We review which technologies are a must and why they are valuable. We consider the important role technology plays in enabling us to grow older comfortably and confidently in our own homes, and how we can personalise that technology so it remains unobtrusive, but is there to help if and when we need it. So many things are possible today with technology. But you really need someone to guide you through the many options. And perhaps even help you realise some new possibilities you had not imagined were possible. Imagine keeping up with what the grandkids are doing even though you haven’t seen them for a month? Imagine having all the movies and music you love at your fingertips? Imagine being able to enrol as a mature age student at Oxford University, from Brisbane, or anywhere? The Guide will show you how to develop a plan for growing older and maintaining your independence. It will help empower older Australians to live the life they choose as they age and we are proud to have been a part of it. For more information about how technology can have a positive impact on your life, visit www.eevi.life. Want to get to know eevi a little better? Take Control and find out how eevi can help you maintain an independent life.